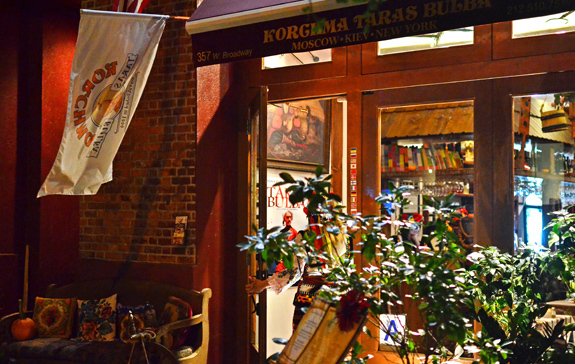 Home Tags Posts tagged with "SoHo"
12 Chairs Café is named after a satyrical novel by Soviet authors Ilf and Petrov that nobody’s ever read outside of Soviet Union. Or is that so? The owners explain on their web site that they “started out as a small café (hence the name) in artistic Soho”, though what makes them believe there’s much of anything artistic left in Soho these days is beyond me. Anyway, this isn’t a Russian restaurant. The cuisine is Israeli — mostly. It’s got a Mediterranean influence, and includes some American staples. Plus all-day breakfast. And a few Russian dishes, as the menu page on the web site unexpectedly declares that “12 Chairs brings Middle East flavors to the Eastern European cuisine”. Which, of course, is what interests us today. 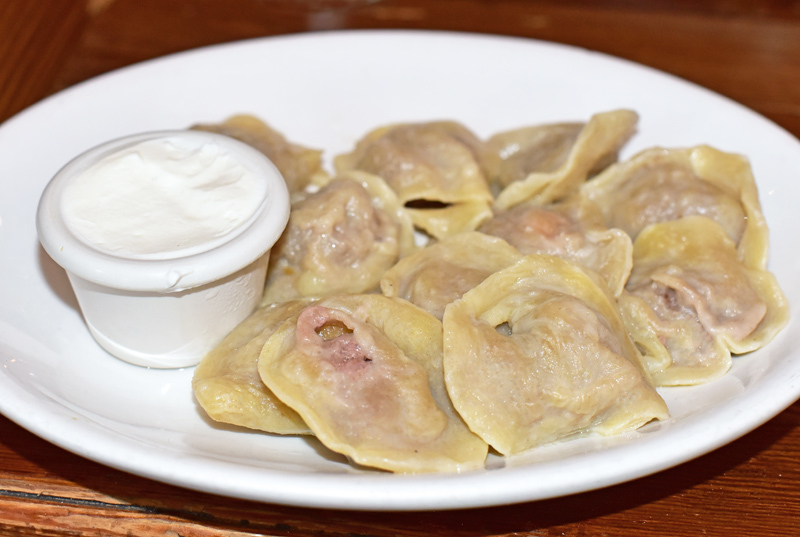 First, there’s pelmeni, or “Russian veal ravioli” as says the menu. These dumplings, certainly homemade, are served with sour cream. The dough tastes a bit funny and somewhat lacks salt. The meat manages to be tasty and juicy, but also a bit compact and with a dry mouthfeel at the same time. Overall, the dish is okay but could be much better. 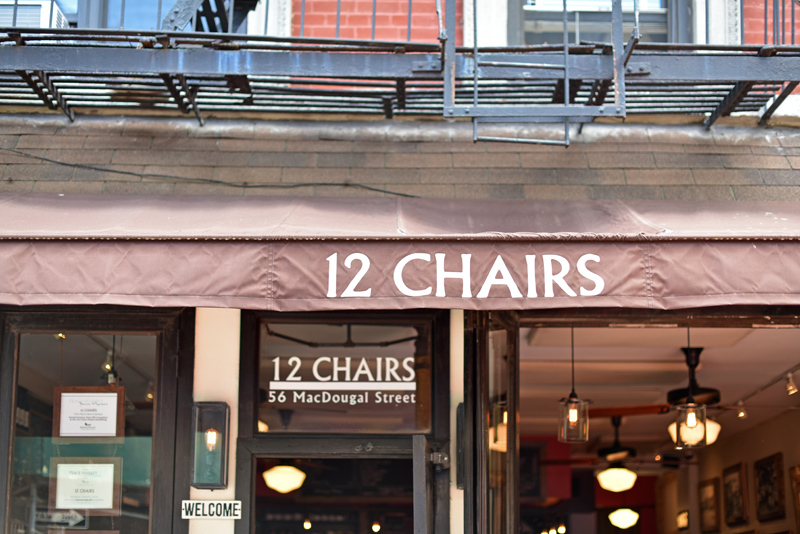 12 Chairs also offers pierogi, “Russian potato ravioli served with sautéed onions and mushrooms”, but we didn’t try them. The golubtsy are just called “stuffed cabbage” here. They’re “filled with ground chicken, rice and vegetables”. You can order them with a side of your choice, lucky you: salad, potatoes (home fries), or potatoes (mashed). I chose the mashed potatoes, which are pretty run-of-the-mill. In my book, one should always be cautious of mashed potatoes so dense that they can be scooped into perfect balls. The golubtsy are the pretty standard Soviet cafeteria version. No, that’s not an achievement. The chicken meat is probably cooked first and then finely ground and mixed with rice and grated carrots that remain crunchy even after being cooked (how do they do that?!). 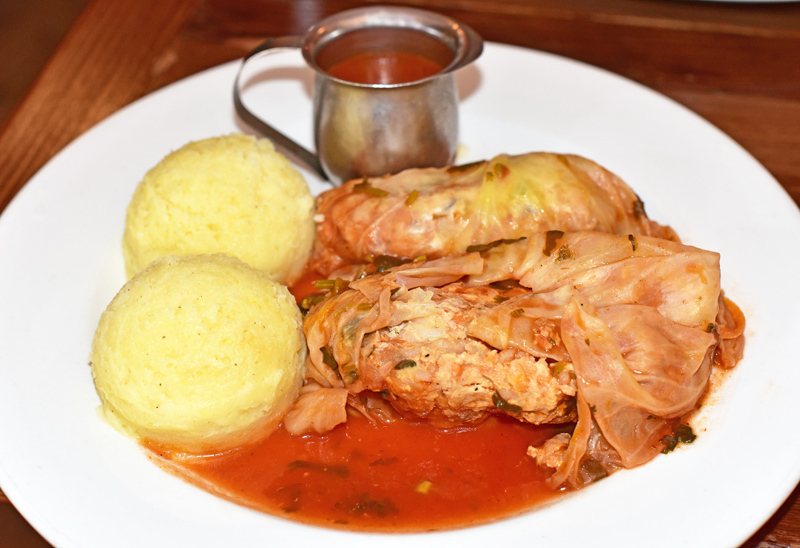 The stuffed cabbage is cooked to the point of disintegration, and served in a slightly sour tomato and cilantro sauce. The whole dish is average at best, arguably below average. I wouldn’t go there to eat it if I had the choice. But what wouldn’t I do for my readers? 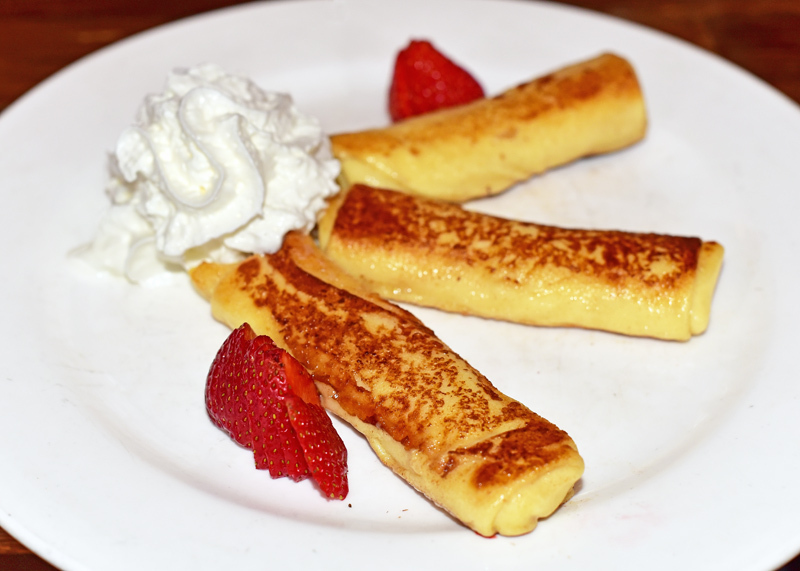 For dessert, the cheese blintzes with strawberries and whipped cream sound like a safe option, right? Wrong. The cheese filling is fine but there’s not very much of it. The blini themselves are under-cooked inside and therefore very doughy. They’re also not sweet at all. It’s like eating an appetizer! On top of that, the strawberries are the usual flavorless, seasonless Driscoll’s, and the whipped cream most likely comes from a can. Not only is this no better than the other dishes, it doesn’t satisfy the dessert craving whatsoever. Just for its redeeming value, I’m adding the hummus to this Red Alert. It may not be Eastern European, but at least it’s won prizes (such as first place at the Peace Market Annual Hummus Taste-Off Competition in 2010). And it’s very good: creamy, mild, seasoned with paprika, with a puddle of olive oil, lemon juice and whole chickpeas in the center. 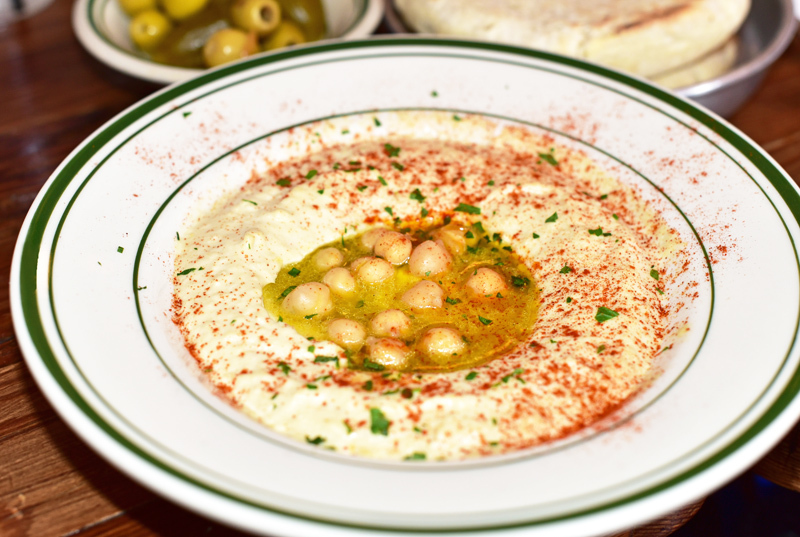 It comes with a warm Israeli pita that’s so fresh it might be baked to order, pickles and delicious green olives. Even if hummus is a simple dish, there’s obviously way more attention to detail put into it than in anything else I tasted. Why aren’t all the dishes at 12 Chairs like that? I don’t know what the food at 12 Chairs Café is worth globally. 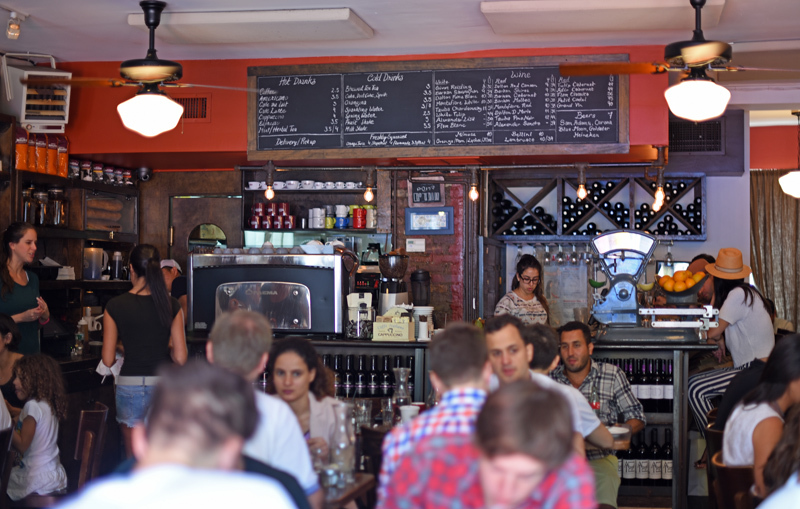 The burgers and shakshuka seem popular and looked good from the next table over, but I haven’t tried them. Maybe the Mediterranean and American food is decent, except for the mashed potatoes? The Russian cuisine certainly isn’t. There’s little inspiration or excitement to be had eating it. Even the photo gallery on the web site stays clear of the Russian dishes because they look rather unappetizing. It’s a good thing I’m blogging about 12 Chairs as a “Red Alert” and not a full restaurant review. Otherwise, it would get one of the lowest ratings I’ve given in quite a while.